Many years back I visited BYLI a new age restaurant in Kalyan Nagar where I met Chef and culinary expert Nirmal Kumar whose food was so wonderful that it always stayed with me. However, many years after I met him again at his new farm-to-fork restaurant aptly called Market Table. And again this time, the food was as unique as it was tasty. Nirmal has worked on the menu with the single-minded focus on being true to serving wholesome, healthy and organic foods. “So we ensured that we do not have any added sugar, maida, deep fried food and refined oils here. At least 80 percent of the ingredients are organic and we believe that using fresh ingredients is the key to good, healthy food,” explains Nirmal. And this ethos shines through the food here. 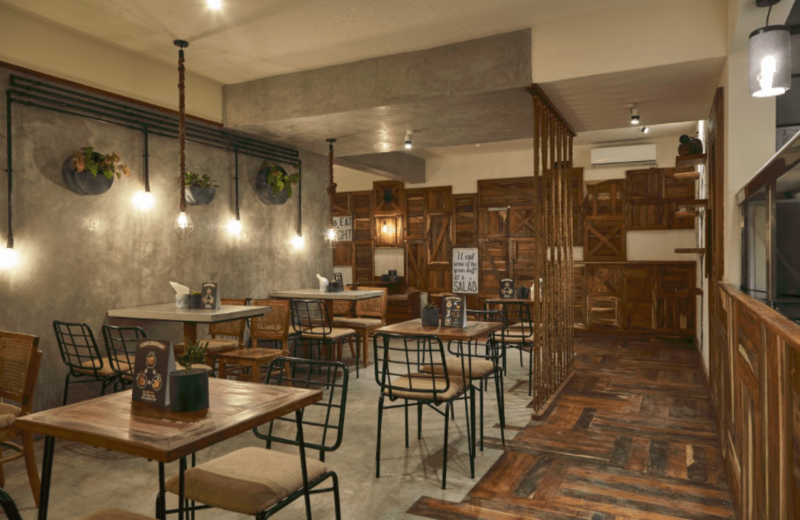 Located in Koramangala’s 5th Block, this 35 cover restaurant has a wood themed, minimalist decor with interesting light fixtures and wall art. We sampled a range of vegetarian dishes recommended by Nirmal starting with The Golden Vitality drink made with turmeric, orange juice, ginger, tender coconut water and a dash of cayenne pepper. 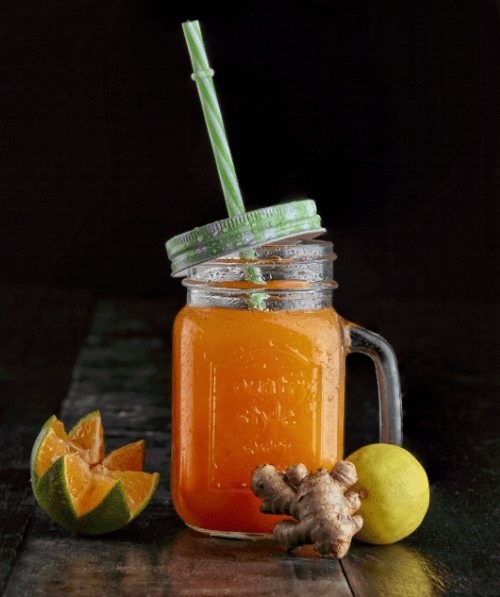 The fresh juice comes with no added sugar and is a wonderfully refreshing drink where the turmeric shines through. We also tried the Popeye’s Virtue, a watermelon drink with apple ice and cucumber as well as the banana-yogurt based smoothie. The drinks are made fresh and served so the ingredients shine through – and yes no plastic straws here only ones made of paper. 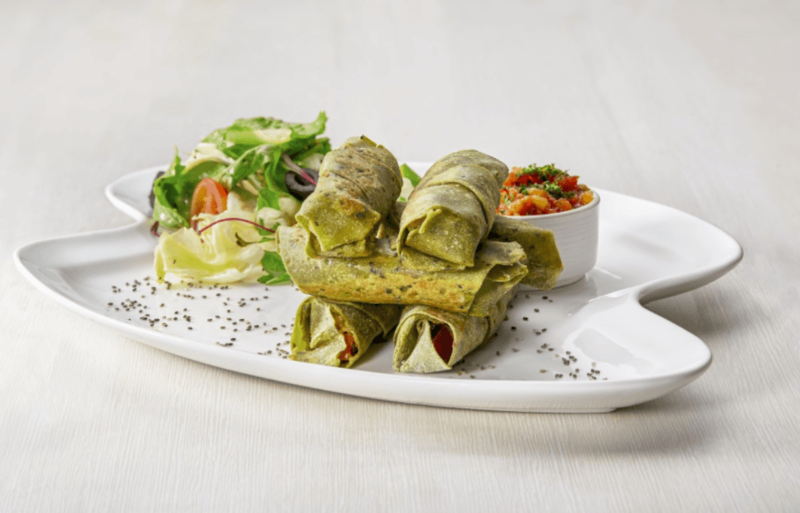 Next, we tried some vegetarian starters recommended by Chef and the first was the Mini wheat chia rolls, wheat flour rolls dotted with chia seeds and filled with insalata, jalapenos, sweet corn, cheese and cheese served with some salsa on the side. The incredible taste of these rolls and light flavours make an immediate connect with my taste buds. The Batata Harara, a Lebanese spiced dish made with baby potatoes, garlic, jalapeno, onions, bell peppers and roasted cumin tossed in olive oil packs a punch. My vote however goes to the Sweet Spicy Market Nuts, a combination of nine exotic nuts and seeds spiced with jalapeno, onion and coriander, a Chef special creation that is so yummy that you cannot take stop munching on them. The main course again has salad as a base and come with an option of having it as a warm bowl a wrap or as a whole wheat grilled sandwich. I opted for a warm bowl called Vegan Body Builder with brown rice and herb rice with tofu, mixed lettuce, brocoli, mixed peppers, onions, sultanas and grated carrots tossed with a spicy cacciatore sauce. 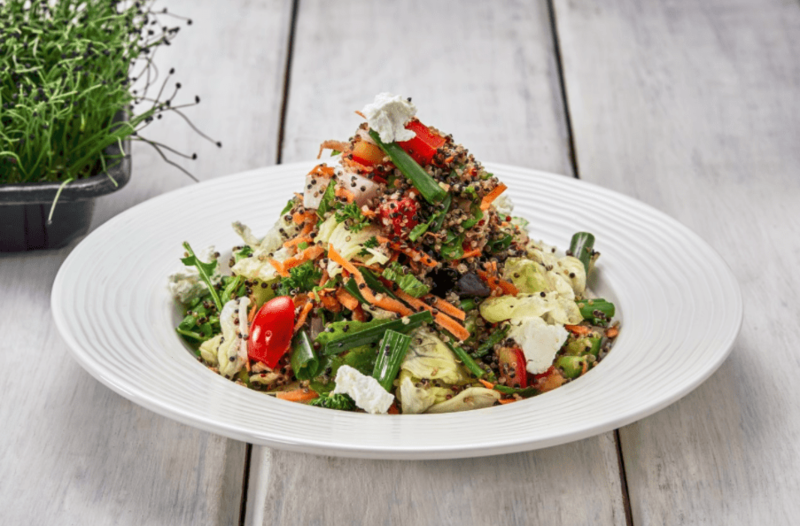 This dish is wholesome and each of these diverse ingredients come together so beautifully that it makes the dish a winner. Non-vegetarians can choose from a prawn option as well as a signature lamb dish that works well in the warm bowl. Keeping the health theme in mind, even the desserts here use healthy options like Hung curd and Greek curd as the base. The Vanilla Yogurt with mixed berries Trifle is bursting with flavours and melts in your mouth. The Frozen Yoghurt Bark likewise is an interesting dessert that is a great choice to end your meal on a sweet note. For me this was a meal experience that showed the good intent of its founders and when the restaurant has its heart in the right place, you know you have a winner.